Heard these on the radio a few times – they’re just begging to be shared. The 50’s-styled campaign, from the Washington Department of Health’s (DoH), is definitely cheesy (Tim Church, the DoH communications director acknowledged as much in an interview with Spokane’s The Spokesman-Review), but the idea seems to try to be weird different enough that people complain talk about it. More Feed your Kids the Arts than The More you Know. All well and good, but does it actually work? How does the DoH know that the expense was worth it? The campaign outreach page assures visitors that the state spent no money on it – the campaign was paid for with a federal grant for flu prevention. How do the feds know that money they sent to Washington State was well-spent? You could look at the number of people who get the flu and compare it to flu incidence in previous years, but there are far too many factors at play. Sure, a downturn in cases could be caused by the campaign, but it could also be caused by a weak flu strain or a particularly good match for the strain in that year’s vaccine concoction. Or maybe the weather was just warmer. There’s a lot going on, so tracking the number of flu cases doesn’t seem like the right measure of campaign effectiveness. Instead, the campaign’s call to action is about proactive steps people can take to protect themselves from the flu. Washing hands and getting the vaccine both lower your chance of getting the flu and are behaviors the campaign could reasonably hope to influence. I’d say make those the key metrics. 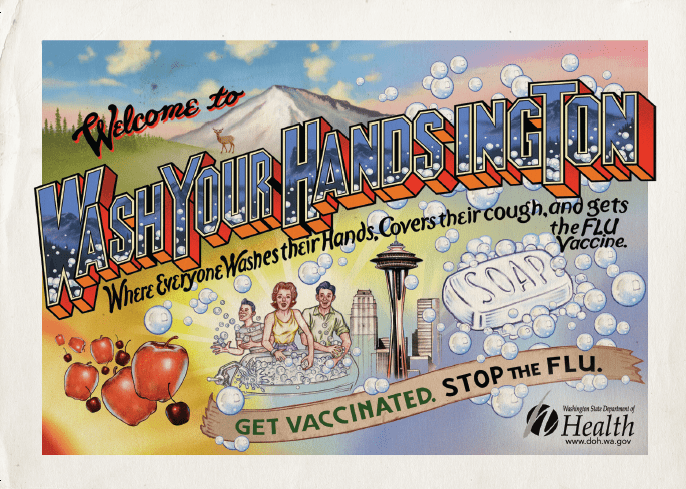 If the campaign increases the number of people washing their hands and getting the flu vaccine, it’s a success. So why am I writing this post? I started out just to share some ridiculous radio spots, but the more I thought about it, the more the campaign seemed like a waste of money — and not for the reason you may be thinking. While the creative is laughable, that doesn’t doom the effort (in this case, at least, the camp appeal seems to have been a conscious decision). No, the worse offense is what appears to be a key flaw in strategy backing it up — a reliance on TV and radio. Not only is impact hard to measure with these traditional placements, but they also just seem like a poor fit. The trouble is, with specific hand-washing and flu shot metrics in mind, I think you succeed with an effort centered on timely reminders and local outreach rather than on TV and radio spots. People already know that hand-washing and flu shots exist, so broad awareness efforts seem misguided. The key would be to remind people to wash up and get a flu shot at moments they can act on the reminders. The campaign could still be ridiculously cheesy (in fact we’ll take as a given that it has to be, based on Washington’s recent history with PSAs), but the application of the Washyourhandsington big idea needs a different orientation to actually affect real people’s behavior in a measureable way. To get people to wash their hands, you need reminders in place where people should remember to head for a sink. The state could give out free boxes of tissues emblazoned with a sticker reminder to take a trip to Washyourhandsington after reaching for a Kleenex. Door handle hangers with a similar reminder provided to local businesses (who have a vested interest in keeping employees well), nursing homes, and hospitals would remind people to take a quick detour to Washyourhandsington while they’re headed down the hall. The campaign could also bring Washyourhandsington locations out of the bathroom and into the public square with hand sanitizer stations. Put the stations up in public places and offer retailers and restaurants a small subsidy toward installing their own. In addition to the same branding as on other campaign pieces, each of these pop-up Washyourhandsingtons could be registered as places for people to check-in on Foursquare or Facebook. Washyourhandsingtonians should be able to advertise each visit to their new home out to their network of friends back in regular old Washington (even if they’re doing it with an ironic smirk). Then you’ve got a truly viral campaign on your hands (sorry, I couldn’t resist). As for flu shot part of the efforts, radio and TV doesn’t seem like a bad place to start reminding, but the campaign could do more. It should take advantage of the personal interaction patients have with the medical practitioners giving the flu shots to turn patients into advocates. The campaign could provide a packet of materials with the batch of vaccines. Suggest that before giving the shot, the practitioner mention the campaign and hand-washing stations and reinforce the importance of getting vaccinated to validate the trip. Once the vaccine’s been administered, provide the patient with a sticker to wear for the day telling everyone that they’ve gotten the shot. Even bring the two prongs of the campaign together by having a hand sanitizing station to use after getting the shot (or a free box of tissues?). Budget-wise, I think you spend at least half of the money on these types of outreach initiatives. Once you’ve got good coverage on the free tissues and hand sanitizer station fronts, then you can put the rest of the budget into media for awareness of the cheesy message. Some banner ads online, Hulu PSA spots, pre-movie spots in local theaters, and sure, some local TV and radio. Media should be cheap – it is a PSA, after all. Now the moment of truth. This rejiggered approach would be much easier to measure than TV and radio spots alone. To see if the effort is working, you monitor the number of posts online about the effort, the number of check-ins at Washyourhandsington portable locations, the number of businesses that install hand sanitizers (and how many refills they need to order), and the number of people getting flu vaccines. Add to that a survey on hand washing habits for a small cohort before, during, and after the campaign and you’ve got a decently measured effort with a glimmer of hope for figuring out if the whole thing worked. It’s too late for this flu season, but I submit that a metric-driven approach is something to consider for next year (if that federal grant comes around again). Measuring effectiveness can be cheap and easy if you design it in from the start. Plus, it ends up forcing a critical look at whether your ideas would have any real impact early on — the perfect time to consider those questions. Even if the state decides to repeat this year’s strategy again, here’s hoping that at the very least they hire a different agency next time around. Maybe get the guy behind Read a Book? He seems to know how to add an entertaining slant to a PSA while retaining a super-clear message. Drive Hammered? Get Nailed. Yeah, they went there. How do you use pants? 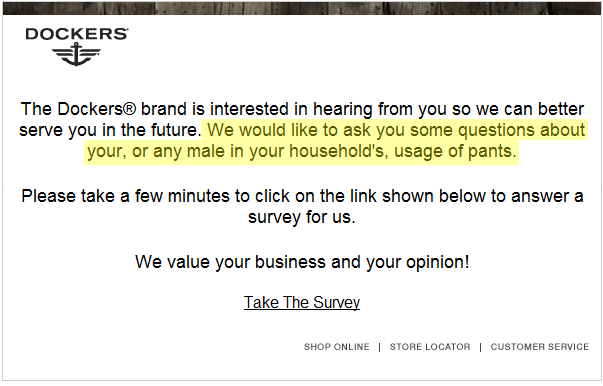 I’m guessing the vast majority of people wear them. A smattering of thoughts from someone who's making it up as he goes along.